Famed Japanese anime Science Ninja Team Gatchaman is coming to the big screen. And it's bringing new Gatchaman suits with it. Those G-suits don't come cheap! According to Japanese site Sanspo, the suits took one year to make, from concept to final outfit. The filmmakers needed costumes that not only looked good, but also that also were easy for the actors to move in for the action scenes. The live-action suits cost 20 million yen, which is over US$200,000. Granted, that total includes all five suits, meaning each one only cost $40,000. Only! The original Science Ninja Team Gatchaman anime was broadcasted on Japanese TV in the early 1970s. Several of the characters also appeared in fighting game Tatsunoko Vs. Capcom. 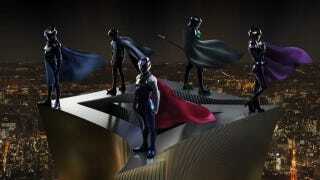 The upcoming live-action version, titled Gatchaman, opens in Japan on August 24.